As every educator knows all too well, teaching can be an incredibly challenging profession. Whether the challenges are rooted in district policies, colleagues’ actions, or student behaviors, the effect on teachers is always the same: frustrating and demoralizing. 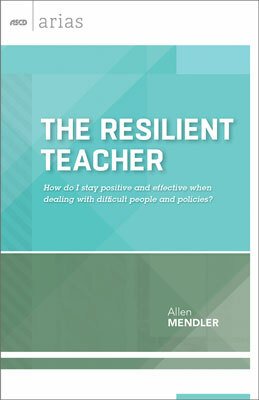 In The Resilient Teacher, Allen Mendler offers simple but effective strategies for dealing with a variety of thorny situations that most teachers will face in their careers. Communicate tactfully but forthrightly with administrators, colleagues, and students whose actions interfere with your ability to do your job properly. Confidently and convincingly express your thoughts and expectations to all stakeholders. Increase your influence with coworkers, students, and parents. All teachers face roadblocks in their jobs that can keep them from doing what’s best for students. In these pages, you will find the solutions you need to resolve common problems quickly and neatly—and to bounce back stronger than ever. ALLEN N. MENDLER is an educator and school psychologist and lives in Rochester, N.Y. He has worked extensively with children of all ages in general and special education settings. He has consulted for many schools and day and residential centers throughout the world, providing training on classroom management, discipline, and motivating difficult students.